Food for Hope: A Global Vision for an attainable, sustainable future. This October, only a short distance apart, like-minded individuals and groups devoted to finding sustainable solutions to the global food crisis were meeting at two related venues in Europe. Italy hosted another of its annual Terra Madre gatherings this month, which was inaugurated with written addresses from the Prince of Wales and the Secretary of the United Nations, General Ban Ki-moon. Slow Food and the Terra Madre Foundation were the organizers of this third world meeting of food communities (terramadre.org; slowfood.com). Turkey was the site of another gathering of people thoughtful about the future of the planet, about nature and intelligent food-production as opposed to the destructive practices motivated by "greed and ignorance," as one participant called it. The latter was promoted under the name Ringing Cedars Readers'Conference. While the Terra Madre gathering was inspired by UN Secretary-General Ban Ki-moon (with his message that "finding long-term solutions to the world food-crisis was one of the priorities of the United Nations", and that he welcomed "initiatives which contribute to such solutions"), the Ringing Cedars Conference, at another coast of the Mediterranean Sea in Turkey, called themselves the "Uniting Nations", in appreciation of the numerous countries represented at the meeting, and their mutual, global concerns for the Earth and its inhabitants. The Ringing Cedars Readers Conference with author Vladimir Megre attracted individuals and groups from Russia, the Ukraine, the USA, Canada, Lithuania, Latvia, Belarus, Romania, Slovenia, Sweden, Iraq, Kuwait, the UK, Hungary, Cypress, Greece, Georgia, Armenia, Germany, Portugal, Spain, Croatia and Australia. 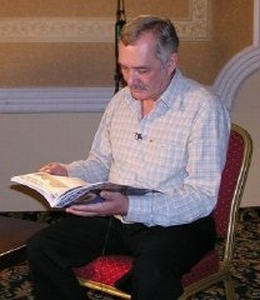 Vladimir Megre is the author of the best-selling book series and he and his writings are a tangible inspiration to millions of readers. A recurring theme throughout all of the books is the personal, social and spiritual power which ensues when an individual or family create what Megre calls their "Kin's Domain," or "Space of Love." The definition of this term is a hectare (2.5 acres) of family-land which is developed into a self-sustaining type of mini food-farm by way of a land-purchase, lease, or trust arrangement. These developments are commonly undertaken as part of an eco-village and celebrate life and freedom from the unnatural pressures and stresses of modern life, while enjoying the comforts and benefits of helpful technologies. Eco-villages are oftentimes found close to large cities, so people who still like to travel to their work can live in loving and nurturing environments while continuing their "city-commitments", which might even include a small indoor food-garden in a city-apartment. Over 300 Kin's Domain eco-villages have been developed or are in various stages of development, all inspired by Megre's own inspiration - namely a young, beautiful recluse woman who has lived her entire life by herself in the harsh environment of the Siberian Taiga - Anastasia. Anastasia is the title of the first book in the Ringing Cedars of Russia series and the name under which over eleven million readers discuss her theories affectionately. In twenty-two languages world-wide, the readers of the series learn that Anastasia had initially met up with Megre at the river Ob in Siberia in 1994. She shared her deep wisdom with him for three days, and permanently changed his life. Megre was a successful and affluent business-man at the time. However, after his time with Anastasia, he began clumsily and miraculously to turn himself into an author, one best-selling volume at a time. In an amazing synchronicity, Prince Charles' inspirational statement for the Italian gathering emphasized that the solution to the current global food shortages, and its ensuing problems, rested largely with what he called "truly sustainable" farming. He also emphasized how crucial it was for the voices of the participants to be heard in the global debates concerning these issues. As quoted from the transcript of his message, he was "enormously encouraged that so many people are today recognizing the benefits of working with nature and harnessing positive forces through healthy soil, healthy crops and healthy animals in order to provide healthy food." And in addressing the sustainable farming community, he expressed "nothing but my greatest admiration for all you stand for." He called sustainable farmers "guarantors of our long-term food security, based upon your dedicated care of the natural environment." Dr. Regina Jensen, a Santa Barbara psychotherapist, attended the Turkey conference. 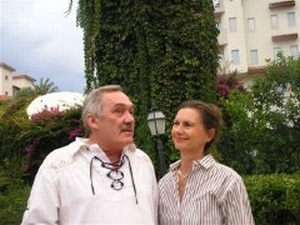 She is an independent writer and editor of the new Space of Love Magazine, with publisher and co-editor Yuri Smirnov. The magazine, in print and online, is one of many international publications supporting the Ringing Cedars movement. 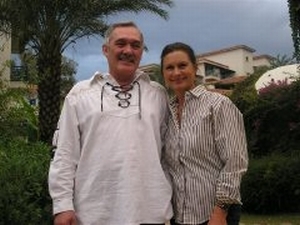 Dr. Jensen attended the gathering to conduct interviews with Anastasia author, Vladimir Megre. The center of her interest with this interview, she said, was the ideas offered by this "inspiring movement," namely Anastasia's and Megre's ability to not only inspire, but inspire-to-action so many thousands of people world-wide. "Most of us know what we should do, or not do, to help save this planet from the thoughtless destruction we have wrought upon it", said Jensen. "But until the Ringing Cedars of Russia information came along - translated into English only a few years ago - we have been unable to find true inspiration, a global vision which would not only inspire, but would also truly transform our endangered planet in a relatively short time. There is something about this wonderful information which has the potential to awaken humanity, which 'Wows' the Soul, as Mark Victor Hansen (co-author with Jack Canfield of the Chicken Soup for the Soul) put it for me when sharing his own experience of the Ringing Cedar books". Dr. Jensen does not make such claims lightly. For some time now, the focal point of her concerns continue to lead her in the direction of sustainability. In that quest, she recently visited Sepp Holzer's International Permaculture center in Austria, Krameterhof, where she found confirmation of the Ringing Cedars information. The Permaculture Center has gained world-renown for its ability to thrive in a very inhospitable climate, with luscious and unusual crops grown on heretofore barren soil. Sepp Holzer, (the owner and nature-genius who has proven that anyone can build a self-sustaining paradise and feed his family, regardless of where they live) besides running the center, now teaches and consults globally. Anastasia and Megre firmly believe that such a Space of Love, a Kin's Domain, will not only offer food, shelter and true freedom, but also a "connection with the Universe" which bestows spiritual strengths and powers by way of a re-connection with universal energies. Notably, Megre often discusses the energies of the plant-kingdom, which, he feels, have been tragically ignored, abused and underestimated. In his books, Anastasia apparently also describes a method with which the plant-kingdom can be engaged to produce food which develops specifically to help an individual to correct health challenges. The global vision of finding ways, either through re-developing inexpensive waste-lands, through government programs of leasing or land-trusts, or by simple land purchases is "as brilliant as it is simple," as one follower has described the concept. Historically, the Russian Dacha Gardens, the German Schrebergaerten, and the American Victory Gardens are examples of families having provided wholesome food - and life - for themselves even during times of economic hardship by way of food-gardening. In some regions, the government is helping people without the financial means to obtain such dreams. Jensen adds that her own family has enjoyed such a family-plot for 56 years, which is still feeding the family with fruits and vegetables. The Austrian Krameterhof (though outstanding in its beauty and fabled climate, and created by way of intelligent harvesting of water, use of large rocks for warmth and novel application of grading and use of plantings) is not the only Permaculture center which is inspiring people who fear that the land they have available is too dry or barren. Geoff Lawton of the Australian Permaculture center, in a celebrated effort in Jordan, showed that "you can make a paradise anywhere" when he "greened" the desert in an area where the parched, salinity-stressed ground was so hard, dry and dead that even the locals were laughing at the idea (greeningthedesert.com). Lawton's demonstration of the intelligent use of water-harvesting and what he calls "swales" is yet another seemingly miraculous transformation, which is deeply encouraging. Megre's books, says Dr. Jensen, describe a vision of plan which can resolve many problems our modern civilization faces today. The food, health, cultural, resource energy and financial crisis may all be restrained and solved without a huge investment and new technologies, but only with the help of wise laws, which will free the land for the people. "The whole world can be a paradise," of growing and blooming parcels of land, tendered by loving families, one hectare at a time. Whether people live in Italy or Turkey, Russia or Germany, America or Australia, or any of the other wonderful countries which were represented at the Turkey conference, we really need very little, "...but it needs to be the right thing. Wholesome food, uninjured nature, good loving friends, family and neighbors, and a safe and clean environment is what most of us truly want. We now have blueprints to create just that - in a very short time - as enough people have demonstrated." More information can be obtained by visiting www.ringingcedarsofrussia.org.